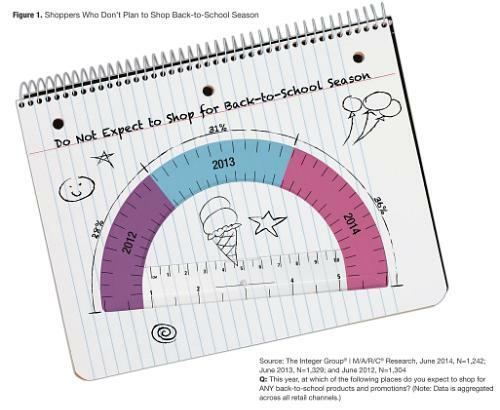 DENVER, Aug. 15, 2014 /– An ongoing shopper behavior study conducted by The Integer Group® and M/A/R/C Research shows that retailers will continue to see the number of back-to-school shoppers in their stores drop. Last year, the data showed a drop of 3.5 percent compared to 2012, and in 2014, the data shows an even greater decline of nearly 5 percent. With fewer shoppers to compete for, retailers and brands will be challenged to focus that much harder on differentiating themselves and outperforming the competition to win over existing back-to-school shoppers. “Shoppers are expected to spend more this year so our study showing a drop in the amount of people who will be shopping presents an interesting dynamic,” said Craig Elston, SVP of Insight & Strategy at The Integer Group. Of those who are shopping for back-to-school, more and more are gravitating toward shopping online. Traditional channels can expect the online channel to continue to grow and absorb their shoppers, with nearly 40 percent of younger Millennial shoppers reporting they will shop online for their back-to-school needs (compared to 23 percent of total). As these shoppers get older and eventually have families of their own, they will likely continue to use retailers and channels they are familiar with. Retailers across traditional channels like mass, office, and department stores would be wise to invest in building stronger multi-channel, back-to-school retail programs that help bridge the digital and brick-and-mortar divide. 44 percent of all shoppers use in-store circulars, referring to them for planning and shopping, which is an increase of 6 percent over 2013. However, in-store circulars are only used by 24 percent of younger Millennials (aged 18–24) and 32 percent of older Millennials (aged 25–34). Finding the lowest price is the most important outcome of back-to-school shopping for 3 of 4 shoppers, but this year’s data shows the biggest gains are in shoppers’ desire for higher-quality products (+8% over 2013) and having more fun while shopping (+5% over 2013). 55 percent of shoppers are saving their trips until 1–3 weeks before school starts, demonstrating a close overlap between planning and purchase. Younger Millennials are more likely to be last-minute shoppers, with 37 percent waiting until the week before compared to 25 percent of older Millennials, 15 percent of Gen Xers, and 14 percent of Baby Boomers.